One of the major findings of Ira Lourie’s 25 year study of Johnson’s atlases is that there is an uneven distribution among the variations of the 67 maps in which some of the over 650 variations have been seen only once and others up to 32 times. The conclusion that follows is that some of these variations are extremely rare (maybe one-of-a-kind) while others are rather plentiful and easily obtained online or through dealers. Yet, the rarer map variations are being bought and sold at the same price as plentiful variations. This study explores the reasons why there are so many variations of Johnson’s atlas maps, the reasons that rarity is not taken into consideration by buyers and sellers, the documentation of the availability of the different variations by the JMP, and the development of a Rarity Index for these map variations. There are two major factors that lead to the relative rarity of the various map variations. The first is that for a number of different reasons Johnson was continually making changes to the maps. The second is that there appears to be a great variability of the number of atlases that were published in different years as reflected by the number of atlases identified by the JMP over the last twenty years. A description of these factors follows. Updating of map details: The major reason there were so many changes in mid-19th Century maps and atlases is they were continually updated in order to be current and a valuable resource. This was especially an issue during the second half of the 19th Century as the nation was changing rapidly. In addition, the selling of atlases in this era was primarily through the work of door-to-door salesmen who would explain to potential customers that every fine gentleman needed to have an up-to-date atlas. 1 , 2 , 3 Alvin J. Johnson was a prime example of this practice. 4 Johnson went so far as to include in his atlases a notification that explained the process of keeping the buyer’s atlas up-to-date by buying and inserting new and/or updated maps into his atlases, using extra spines included in the binding of the atlas. In order to keep the maps in his atlases updated Johnson was continually making changes to include 1) new states and territories, counties, 2) changed state, territorial and county boundaries, 3) cities and 4) railroads. Many of these changes, especially the jurisdictional ones, were placed into the maps as soon as possible. New states and territories were named on the maps almost as fast as they were established. As this happened, a variation of a map was sometimes only used for a short period of time. A good example of this is found during 1863 with Johnson’s 1862 New Military Map of the United States, (Johnson Map Project catalog number: JMP-159). He used four different variations over that one year; two of those variations have been seen often and two seem to have been used for only a short amount of time before new states and territories were established and as a result those two are rarer, as indicated by having had limited sightings during the life of the JMP, (see Table 1). Newly formed counties took about two years to make it on to the maps, but in spite of this lag they appear to have been entered on the maps as soon as the firm found out about them. A good example of this is found with Johnson’s 1863 map of Georgia and Alabama (JMP-114), where in 1869 the map was changed twice during that one year: first for the addition of 8 counties and next for the addition of 2 more counties. Each of these changes created a new variation of that map, in this case variations 5 and 6 (JMP-114-5.0 and JMP-114-6.0), 5 making them and the immediately prior variation rare (see Table 2). Railroads and cities were also being added and changed as Johnson’s firm discovered them. From 1877-87, there were numerous changes that at times were the only changes from one variation of the map to the next. However, railroad and city changes do not seem to have been made on the maps with the frequency of states, territories and counties and do not appear to be a factor in creating rare map variations by themselves. Design and organizational changes. On the other hand, changes in the design and organization of the maps played a major role in the creation of rare variations. These include changes in 1) borders, 2) publisher attribution, 3) atlas organization, and 4) other details. While many of these changes appear to be minor and not particularly notable (of “map state” importance), they have created unique variations some of which are rare. These changes are also useful in the identification and dating of loose maps which have been removed from atlases. Borders are a major design/organizational factor in the variability of Johnson maps. Unlike the other major U.S. atlas publishers such as Colton and Mitchell who used one signature border for all of their atlas maps over the years, Johnson changed his border four times. 6 These borders were used chronologically, with Border 1 being used from 1860-62, Border 2 from 1862-1870, Border 3 from 1870-83, and Border 4 from 1883-87. While the new borders were phased in over time on different maps, there has been only one occasion discovered by the JMP in which an older border was used after a new one had started being used on one map. Publisher Attribution is another major design/organizational factor in the creation of new map variations. Johnson changed the name of his company or the typeface used to print the name on the maps five times. 7 Originally printed as Johnson and Browning from 1860-62, the company name was changed to Johnson and Ward during 1862. This name was printed in the same plain block printing as Johnson and Browning had been until later in 1863 when he started using a more formal outlined font. This more elaborate Johnson and Ward attribution was used until some time in 1866 when the company name attribution was changed to A.J. Johnson. The company name Alvin J. Johnson and Son was phased in over 1879 and 1880. However, this lasted only a short time and by 1881 the company name had changed for the last time to Alvin J. Johnson and Co, although some maps continued to use the “& Son” title through 1883. Atlas Organization is the third major design/organizational factor leading to map variations. This includes changes in pagination. Johnson added 13 new maps over the years and the page numbers would change for every map beyond the new one; there were also a number of occasions when a one page map would become a two page map. An example of such an organizational change which required repagination of 14 maps occurred between 1864 and 1865 when the map of the West Indies, which had immediately followed the Florida map was moved further back in the atlas. Another example of an organizational change also related to the placement of the West Indies map. In this case, on one occasion for a very short time, the single page map of Florida was combined with the West Indies as one two-page map which created not only a unique variation, but also two pagination changes: one when the change was made and the second when it was reversed. Still another organizational change that caused the production of a rare variation occurred in 1864 when Johnson created a new map of California and the western territories (JMP-105). When this map was first produced, it started to be used as pages 58-59, then almost immediately a major pagination change occurred and the map was then used as pages 66-67. It appears that very few were printed with the old page numbers as this variation (JMP-105-1.0) has only been seen once during the JMP study. Other Details: There were many small changes that led to the creation of rare variations. These details include ones that are visually easy to find to those that are extremely small. Among the easily observed details are pictures that Johnson placed on many of his early maps (most of which were Colton maps into which Johnson added pictures). On some occasions, pictures placed in a map would change places on the map, which not only led to a new variation but also was an indication that the pictures were not etched into the plate but rather were placed in the plate each time the map was printed. 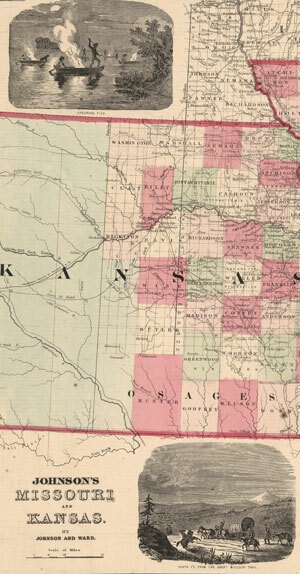 One example of this is with the Missouri and Kansas map of 1860 in which two pictures kept switching places over the 10 variations and 16 years the map was used. One such change from this series between 1864 and 1865 is shown below in Figure 2. On other occasions the size of the font used in the titles under the pictures would change. On still other occasions a picture would be placed in a slightly different position on the plate obscuring different parts of the underlying map; this slight movement also occasionally occurred with the placement of the map title. Another example of detail changes can be found in Johnson’s 1860 map of Delaware and Maryland. In 1862 Johnson began inserting an inset map of the District of Columbia which included the “Population of the District of Columbia” and the “Population of Georgetown.” Between that time and when the map was replaced in 1869, these “Populations” would show up in various combinations (both, one or none), creating one rare variation. Two maps from 1864 and 1865 demonstrate these changes. 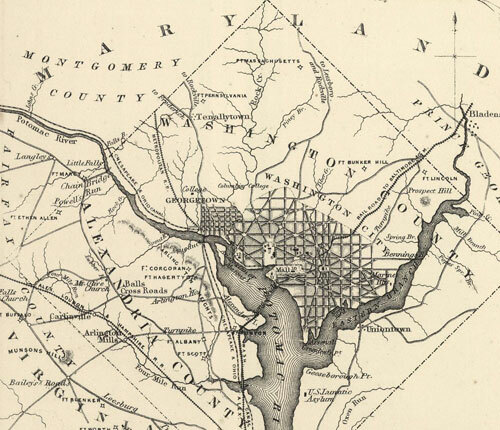 Similarly, on the 1860 Delaware and Maryland map, after the first edition, there was a pagination change and the addition of several pictures. Shortly after these changes a mar on the plate occurred creating a black dot in the “d” in the name Concord in the legend, which remained on the plate until sometime in 1862, at which time it was corrected along with some other changes. This created a rare variation in the few maps printed in the time after the pagination and picture change but before the mar occurred. While the JMP has yet to discover any atlas publication data, it has tracked the number of atlases the Project has identified from each of the 27 years during the span in which they were published. As of December 2014, our study included 189 atlases. 8 An assumption can be drawn that some maps would be rarer than others because of the differing number of atlases that have been discovered for each of the 27 years, ranging from a high of 31 in 1863 to 3 or less in 11 of the years from 1871-87 (for two years, 1875 and 1876, no atlases have been discovered). 9 Table 3 below demonstrates the uneven distribution of atlases during the years of publication with most coming from the 1860s, fewer from the early 1870s and fewer yet from the late 1870s through the 1880s. A strikingly similar distribution is also found among the over 1300 maps that have been offered for sale on E-bay over an 18 month period in 2013-14 as identified and cataloged by the JMP. 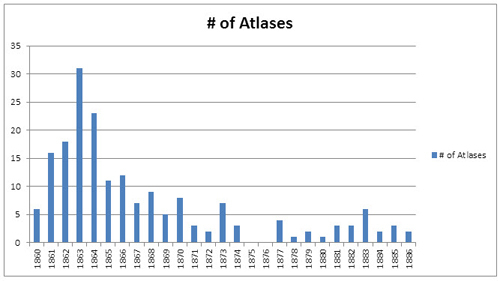 This finding reifies the atlas data above (see Table 4). Table 4. Number of For-Sale Maps Seen by the JMP by Year. The uneven distribution of atlases and maps over the years, described above, becomes the second factor leading some Johnson maps and atlases to be rarer than others. Only one intact 1872, 1880 and 1887 atlases have been seen along with one split 1878. Only two from 1879 (one split), 1884, and 1886 and three from 1871, 1874, 1881, and 1885 have been seen. On the other side, 16,19,31,23,12 and 13 atlases have been seen from the years 1861-1866 respectively. This data strongly suggests that in general maps from atlases published from 1861 to 1866 are much less rare than those published in other years, and conversely, maps published from 1871-1887 (with the exceptions of 1873 and 1883) are the rarest of all. Lack of information is the major factor which has kept the rarity of Johnson atlases and their maps from consideration. Until the JMP began to catalog atlases and loose maps, no one has had the data about which atlases and map variations are rarer than others. Even the major collectors, who owned the only complete 1872, 1878 and 1879 atlases thus far discovered, did not know these were the only complete atlases seen from these years until being informed by this author. The information presented in this study and the data held by the JMP document the number of map variations among Johnson’s U.S. maps and their relative rarity; this is similarly true for rarity of the atlases from various years. This lack of information is compounded by the fact that the value of mid-to-late 19th Century atlas maps, including Johnson’s (along with Mitchell’s and Colton’s), has been driven primarily by their high relative general availability, which is demonstrated by the high number for sale on E-bay this study has documented. They are most often sold to individuals who do not appear to be map collectors, but rather people who want a pretty and old map of an area they have some interest in. 10 As a result a plentiful, easily available map of Texas, California, New York City or the “Vicinity of Richmond, and Peninsular Campaign in Virginia” will sell for a much higher price than a one-of-kind variation of a less popular map; this occurs as neither the buyer nor seller knows the rarity of the map. Within this paradigm, no one has cared about which variation of a map they purchase: a map is a map and the area depicted on a map drives its value rather than its rarity. Another factor of the generally low value of his atlas maps is that Johnson has not been seen as a major cartographer and his maps have been seen as having little cartographic importance; Johnson’s work is barely mentioned in cartographic histories. Thus, in the past there has been little information available about Johnson, his atlases and maps. At the same time, the other major atlas producers of the same era, Mitchell and Colton, both have been seen as being worthy of study and as thus their maps have become much more collectible (although loose maps from their mid- to late-19th Century atlases tend to be valued similarly to Johnsons’). The JMP has been collecting data on the different variations of Johnson’s US atlas maps since the late 1970s. This first occurred through studying the collected atlases of the Library of Congress and Yale University, and other libraries across the country and also the extensive atlas collections of David Rumsey and Roger Baskes. Over the last two years further data has been collected by cataloging all of the Johnson atlas maps available for sale on E-Bay and several dealer web sites. As of February 2016, 4717 maps have been seen representing 658 unique variations of the 67 US maps used by Johnson in his atlases from 1860-1887. Of these, 1966 were cataloged from loose maps and a few in for-sale atlases on E-Bay and other websites with 2751 having been cataloged from atlases in collections (see Table 5). Table 5. Number of Maps Cataloged by the JMP by Collection and For Sale. Of the 658 variations cataloged, 646 were seen in the collection maps. There were only twelve variations seen in only the for-sale maps (2%). 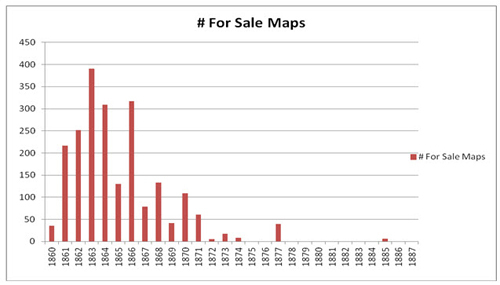 At the same time, there were 253 variations not seen among the for-sale maps (38%) (see table 6). Table 6. Number of Map Variations Seen by the JMP by Collection and For Sale. The number of sightings of individual variations among the 4717 observed maps range from 1 to 32. About a quarter of the maps had only 1-2 sightings; another quarter from 3-5 sightings; another quarter from 6-8 sightings; and, the last quarter had from 9-32 sightings. It is this variability in the number of times a map variation has been seen which ultimately defines a map’s degree of rarity. This is based on the assumption that the number of times a map variation has been seen both within the atlas collections and the maps for-sale reflects the rarity of the particular variation: the fewer the sightings the rarer the map variation. When one takes into consideration the fact that many fewer atlases seem to have been produced during the years from 1873-1887, this relative rarity is reflected in the fact that there are many fewer variations with multiple sightings during that 15 year period than in the 13 previous years, thus leading to more maps that should be considered rare during the period after 1872 (see Table 7). When the for-sale sightings are looked at alone, the data has a similar distribution, with several differences. First, there are 38 percent of all variations which have never been seen for-sale during the period of this data collection. However when broken down by era, only 18 percent of the variations used from 1860-72 were not seen for-sale compared to 86 percent of variations used from 1873-87. As with the data from the maps from both collections and for-sale, the for-sale only numbers demonstrate the extra rarity found in the later, 1873-87, dates of production (see Table 8). When this paper was first published in the Portolan in 2014 only about 1300 maps for-sale on E-Bay had been cataloged by the U.S. Johnson Map Project. Since that time, another almost 700 maps have been cataloged. Based on the new collective data of all 1966 map sightings, the Rarity Scale has been refigured from that in the Portolan article and the reconfiguration is what is found in this current version. Given the factors leading to the low production of certain map variations plus the results of the data collection, with about 25 percent of all variations only having been seen one or two times in either a collection or for-sale, it becomes clear that there are variations which are indeed rarer than others. This conclusion is further driven home by the data demonstrating that 41 percent of the variations seen in collections were not seen for sale during the data collection period. Since there are 658 variations and only 1966 for-sale maps cataloged, one could come to the conclusion that there is some room for sampling error. However, when one looks at those individual variations that have not been seen for sale, those variations also have fewer sightings in collections, with 96 percent of them having been seen three times or fewer in collections thus validating their relative rarity. 11 This leads to the conclusion that, at least from a subjective point of view, the sample size was sufficient to reflect rarity of each unique variation and that this rarity should to be taken into consideration when valuing individual Johnson atlases and atlas maps (see Table 9). While it would be easy to go through the Rarity data and make subjective decisions as to which map variations are rarer than others, it is understood that there is room for a great degree of variability among individual subjective observers. In order to create a less subjective standard for the rating of rarity, the JMP decided to create a numerical Rarity Index based on the number of sightings during the study; it was felt that such an index would be more useful, and less open to misinterpretation and/or misuse. However, such a numerically determined rarity index needs to be tested against a set of subjective ratings to measure its validity. In the development of the Rarity Index, the assumption was utilized that map variations which had been seen for-sale should necessarily be seen as less rare than those which had not been seen. To correct for this assumption, a numerical scale was created to quantify variation sightings which gave more credit for a for-sale sighting than one from a collection. This was based on the idea that the availability of a map for sale is a better indicator of relative rarity than the status of being unavailable as are those maps in collections. Thus the numerical Rarity Index scale was created so that any map sighting would receive a score that consisted of a base score plus a bonus if it had been seen for sale. After a period of experimentation with the data set, it appeared as if giving one base point for all sightings plus a one point bonus for each for-sale sighting (“1-2 Weighting”) created rarity ratings that best reflected a set of subjective ratings for the same maps. One of the advantages of this “1-2 Weighting” is that it takes into consideration two groups of variations which under a system that does not give a bonus for a for-sale sighting would lead to faulty results. The first of these two groups are those situations in which map variations were seen numerous times in collections during periods of high atlas production where one could reasonably assume that there should have been for-sale sightings yet no such sightings had yet occurred. The second group was those infrequent but significant situations in which few or even no collection sightings were made while there were a number of for-sale sightings. In both cases the “1-2 Weighting” created a numerical score which closely represented a subjective view. Table 11. Comparison of All Map Variations Seen vs. Those For Sale, by Years. An example of how this 1870-87 Factor affects the numerical Rarity ratings is found with Variation #3 of the Boston 1870 map (JMP-103-3.0. ), published from 1881-87, which was seen 16 times in collection atlases but never seen for sale. At the same time, variation #10 of the Arkansas, Louisiana and Mississippi 1860 map (JMP-101-10.0), published from 1865-66, was seen 4 times in collection atlases with 6 sightings for sale. As shown in Table 12, when counting the collection and for-sale maps as having equal weight (as was done before the “1-2 Weighting”) the plentiful Arkansas map variation is shown as rarer than the Boston map variation (10 vs 16) which has never been seen for sale. Under the “1-2 Weighting” rating scale they have the same score (16). Even the most skeptical observers would have to admit that the Arkansas variation was more plentiful and thus much less rare than the Boston variation. This is especially true if one makes the assumption that availability for sale is a more reliable factor in determining rarity than having been seen in a collection. On the basis of this and similar findings, in order to more accurately reflect the subjective rarity ratings of 1870-87 map variations, it was decided to separate the 1870-87 the map variations from those from 1860-1869. For the 1870-87 group, the base score given for each map variation was reduced from 1 to 0.3, while still retaining the 1 point bonus added to for-sale map sightings. As demonstrated above in Table 12, now the rarer map has a score of only 4.8 compared to the 16 score of the more available map. This created the scenario in which the objective Rarity Index scores of 100 percent of the map variations from this time period correctly reflected the subjective ratings. Another group of map variations that does not seem to fit the “1-2 Weighting” are those from the first edition published in earlier 1860. These atlases are rarer than other 1860 atlases and the maps are less often seen for sale. Only 10 of 22 (45%) of this group of variations were seen for sale vs. 22 of 25 (88%) for the other varieties used in 1860. However, with the “1-2 Weighting” some of these maps fall into the average range in spite of the relative rarity of these first edition atlases, which would suggest that all of these maps should be seen as rare. Thus in order for the Rarity Index to more accurately reflect these first edition 1860 maps, it was decided to treat them numerically like the 1870-87 with a reduced base point score of 0.3 plus a 1 point for-sale bonus. The other special group that needs to be discussed is sub-variations. There are a small number of variations which within the JMP data set are broken down into sub-variations. 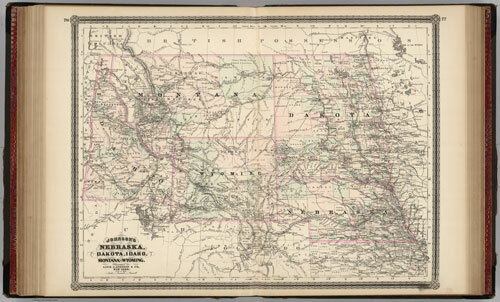 The most interesting of these is with the Illinois-1860 map (JMP-118). On this map, the southern tip of Illinois sticks through the border of the map. In doing this, the name of the southernmost city in Illinois, Cairo, appears to get disturbed in the set up and printing of the map. Each time this map was printed it appears as if they dealt with the character and font of the name differently thus creating seven changes, including one in which it is just a “C” and another in which the name is left off completely. On three of these occasions this is the only change in the map (see Table 13). As of now, the JMP is calling these three, “sub-variations of Variation 3” (a,b,c) and counting each separately in terms of rarity. This is true for all of the sub-variations in the JMP database. In summary, the Rarity Index scores that are presented with this paper use the formula of 1 point for all collection sightings of map variations from later 1860-72, 0.3 points for all collection sightings of map variations from the first 1860 edition and from 1873-1887, and a 1 point bonus for any for-sale map seen during the study period (see Table 14). The next step in the development of the Rarity Index was to translate the sores into categories of rarity. The first attempt at doing this was discussed earlier and included a five point scale (Rare, Relatively Rare, Average, Relatively Plentiful and Plentiful) that had been used to subjectively rate the variations as a test of the numerical scores. However these subjective ratings created some overlap in the numerical Rarity Index Scores. This overlap occurred mostly between the Rare (0.3-5), Relatively Rare (5-6) and the Average (6-9) categories. There was also some overlap with the Average (6-9) and Relatively Plentiful (8-10). In creating categories of Rarity based on the numerical scores it was decided because of these overlaps in the categories to split the Relatively Rare category with the 5’s going to the Rare and 6s to the Average. The Average and Relatively Plentiful categories (of which there were only 8) into the Average. In the final configuration the Rarity Scale has only three categories: Rare (0.3-6; up to 9 for 1870-72), Average (7-12) and Plentiful (13+) (see Table 15). The U.S. Johnson Map Project database on this website, includes the Rarity level of each map variation. It appears as if rarity has not often been a factor in the buying and selling of mid to late 19th Century atlas maps, rather they are sold on the basis of age, geographic desirability and design. However, the JMP has observed that, as the maps were updated over the years, numerous variations of each map were created. The data collected on Johnson US maps seen both in collections and for sale demonstrates that some of these maps are much rarer than others. To create equitable value for these maps, the JMP has developed a Rarity Index to highlight the degree to which individual map variations should be valued. As one can see from the methodology and data presented above, the process of developing this Rarity Index has been based on a number of assumptions. As such, the degree to which these assumptions are valid and/or meaningful define the validity of the Index. The JMP tested a number of these assumptions using the data presented in this paper. Further, at a meeting of the Washington Map Society at the Library of Congress in March 2014, many of these assumptions were presented, challenged and discussed. The first of these assumptions is that the number of atlases seen in collections and for sale truly reflects the publication data and is an accurate guide of the rarity of the maps published from various years. Unfortunately, there appears to be no other method for judging the number of atlases produced in any one year without the availability of publication data. However, there is one data set that adds validity to this assumption is the data which demonstrates that the availability of maps for sale mirrors the number of atlases seen in collections and for sale. This of course leads to the second assumption, that the number of maps from each year seen for sale over the two-year study period is a valid predictor of the number of atlases produced. How can one test these assumptions without the availability of true publication data? Given the nature of antiques in general, if there were an equal number of an item produced in two eras, the ones produced later in time would be more plentiful after one hundred and fifty years than the ones produced earlier. Yet with Johnson Atlases and maps, the reverse is true, with the older atlases and maps from the 1860s being much more plentiful in the present day than the newer ones from the 1870s and 1880s. This does not appear to be a statistical quirk by virtue of the extremely low number of the later atlases and maps available today in comparison to the earlier ones. The JMP has accepted these assumptions about publication differences as valid and they were not challenged at the discussion during the Washington Map Society. The next assumption present in this study is that a sample of 189 atlases identified over twenty plus years and over 1300 for-sale maps identified over a year and a half are valid samples. As to the atlases, they initially were represented only by those in collections. As atlases were identified during the for-sale map study period, they did not change the distribution patterns of the collection set group. As for the for-sale maps, the first compilation of the data in this study in the Spring of 2014 was based on around 1000 maps and the succeeding 900 maps seen in the following six month period has not materially changed the distribution of maps by year. As a result of these data, we are comfortable about the sample size in terms of reflecting publication numbers; this assumption was also not questioned in the Map Society discussion. A final issue pertains to the development of the scoring system which underlies the Rating Index. As was pointed out in the Map Society discussion, the numeric system for scoring rarity was made through a process in which the formula for weighting collection vs. for-sale sightings was adjusted until it coincided with the subjective ratings that had been observed. There was some feeling from the participants that this was “cooking the books” to make it come out the way we wanted it to be; some also thought that true rarity would follow from giving equal weight to collection maps, for-sale maps, 1860-69maps and 1870-87 maps. However, the JMP did and does not agree with this interpretation given the examples cited in the methodology section of this paper. We believe that we have strived to make the best fit of numerical ratings to a rather subjective set of qualities and that we have been successful. In summary, the JMP believes that the assumptions made in the development of the Rarity Index are valid. We therefore feel comfortable in presenting our findings to the public in the hope that, in the future, valuation of individual Johnson atlas maps will be made on the basis of rarity as well as desirability. It is our opinion that 1) knowledge about the existence of the numerous variations of these maps will make them more collectible and 2) the valuation of rarer variations will encourage buyers and sellers to make more informed decisions in the Johnson atlas map trade. The same can also be said for atlases, where the JMP data demonstrates that ones from some years are rarer than others. We welcome comment and discussion on the issue of rarity among mid-19th Century atlas maps, our assumptions and methodology and the value/validity of our Rarity Index. Bosse, D., “A Canvaser’s Tale,” The Map Collector, No.57, Winter, 1991, p.22. Harrington, B. How ‘Tis Done, Chicago: Fidelity Publishing Company, 1879. Lourie, I.S., “The Atlases of A. J. Johnson,” Portolan, No. 49, Winter 2000-2001, p.17. From a cartographic point of view, these jurisdictional changes should be considered different map states rather than merely variations. However there are many other changes in the maps that might not qualify as different “map states” and thus have been defined by the Johnson Map Project as “variations”; indeed the Johnson Map Project uses the term “variation” for all of the “states” and “variations.” These other non-jurisdictional and railroad changes include changes in the name of Johnson’s company as printed on the maps, changes in borders, changes in pictures (including changes in the position on the plate where the pictures appear), and changes in other details including mistakes made and corrected. The tracking of atlases started with the atlases cataloged in our study of Johnson Atlases in libraries across the country and in the large collections of David Rumsey and Roger Baskes, which we were generously invited to study and catalog. To these, we have added all of the Johnson atlases for sale on E-bay for the last year and a half, including some partial atlases represented by a series of maps on sale from one dealer where it was clear that the maps came from one atlas. It had been assumed that in 1875, 1876 and 1878 no atlases were produced because Johnson was busy working on his Cyclopedia during those years including developing maps for inclusion in that tome. However, the same assumption had also included 1872 until two atlases from that year were discovered over the last two years and an 1878 atlas was discovered during the writing of this paper. One book dealer once told this author that he would often send the buyer of an historical fiction or non-fiction book an old map of the area written about. This author has also observed historical fiction writers using these maps in libraries to gain knowledge about the geography of an area they are writing about. These percentages do not hold for the map variations used from 1873-87 where only 52% of the variations not seen were seen in collections 3 times or less. This is due to factors discussed later in this paper under the section on The 1873-87 Factor. There were several 1873-87 variations with high numbers of sightings (ranging from 10-16). Eleven such variations can be found for the period from 1873-77, while there was one from 1873-1880, one from 1883-87 and two from 1881-87. At the same time, every map variation used from 1884-87, had at least 7 collection sightings (one of these had 8) and similarly all but two variations used from 1881-83 had at least 6 collection sightings (one of these had 7 and one had 8). With all of these high multiple sightings in collections of all these 1883-87 maps, only 5 were seen for sale from these years.